Haha Dee Dee...look I was selling my child rofl NOT! 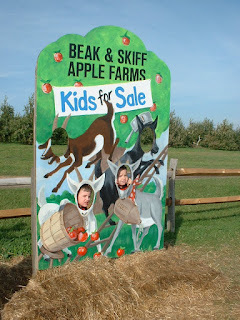 We went to our local apple farm and this is his friend from his class in the photo with him. This was his first time there and he loved it and loved that he could pick his own apples. They gave us a special deal that day....generally they charge more, but they gave each child a bag and said it would be a dollar. They usually charge by the pound, but this was exciting for the children. They have awesome apple cider as well. As I mentioned on my friend's blog there is something special but you'll have to go here and find out the details. Here's the link to her blog..... Dee Dee's Blog Have fun!!!! Woohoo, thanks for playing along my friend! GREAT picture BTW! HUGS! Cute photos.... and I love the new look on your blog too.